Immerse yourself in luxury at our Royal Suites located at the heart of Pomegranate resort with a stunning view to Aegean Sea. Enjoy cinegraphic sunsets at your balcony or, better yet, in your private infinity pool with sea salt water. Marble, wood and glass are combined to create a stylish interior with a thoughtful design for a maximum of your comfort. Extra spacious 650 sq.m. Suite can be easily divided into 4 smaller Suites. Royal Suite (650 sq.m. ), separate Suites or a combination of several Suites are available for booking. Suite can be easily divided into 4 Suites. Luxurious 245 sq. 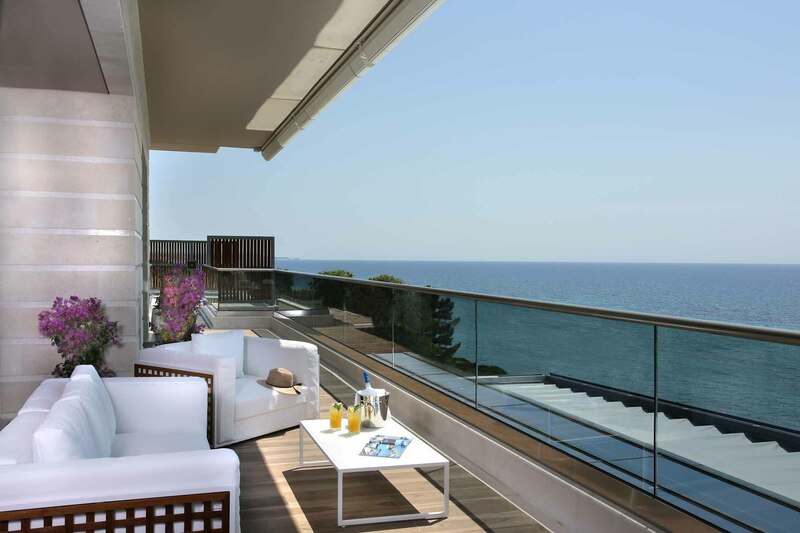 m. suite with a private infinity pool with sea salt water and magnificent view to Aegean Sea & Mount Olympus. 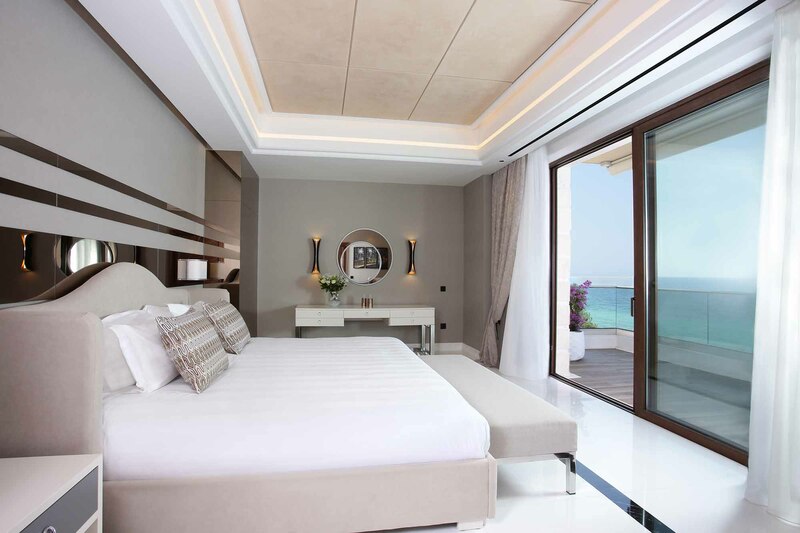 Suite consists of 2 bedrooms, an office, a spacious living room, panoramic terrace, a private infinity pool, 4 bathrooms and a walk in wardrobe. 120 sq. m. suite with a smart design with every detail in mind and panoramic view to Aegean Sea sunsets. Elevator bed in living room provides comfortable accommodation for 4 guests and for bigger parties Suite B can be united with Suite A. 129 sq. m. suite with 2 bedrooms, 3 bathrooms, a spacious living room, walk in wardrobe and a terrace with side sea view. Suite C is perfect for families with kids thanks to 2 twin beds in the 2ndbedroom. Maximum capacity is 5 guests. SUITE D is a cozy 59 sq. m. suite for accommodation of 1 to 3 guests. Suite D consists of a living room, bedroom with twin beds and a bathroom.